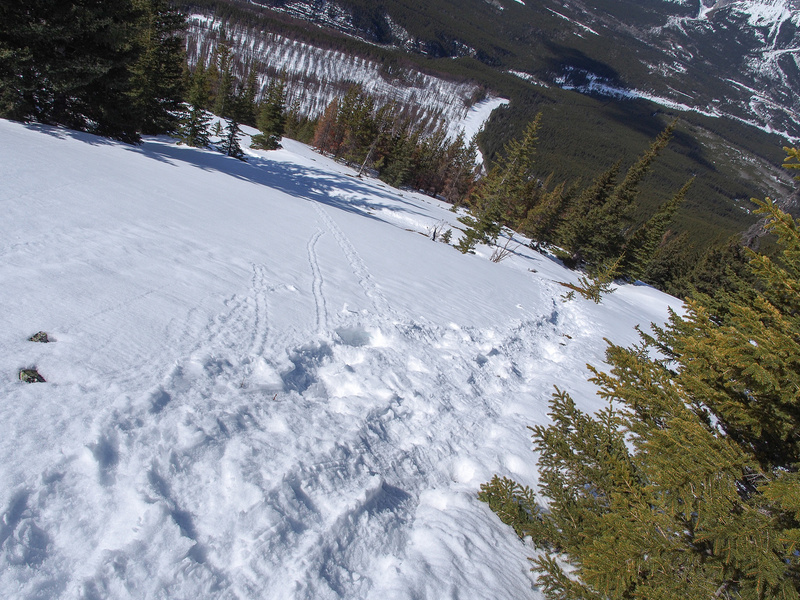 Difficulty Notes: Some avalanche terrain in winter and some bushwhacking and route finding. 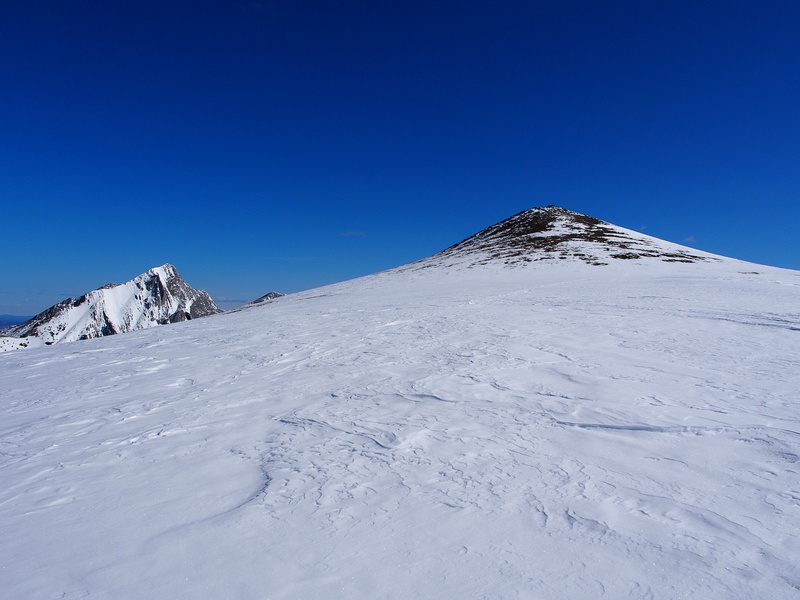 After reading that Jose and Fabrice had kindly set down a ‘shoe track on Volcano Peak in late March 2013, I decided that Good Friday would be the perfect opportunity to do a solo trip on a beautiful spring day on their hard-won trail to finally finish off the ‘grand traverse’. I was right! Volcano Peak can be done as part of the “grand traverse” from Wasootch all the way to Volcano, passing over GR338442, Kananaskis Peak. Old Baldy Mountain and McDougall before finally coming over Volcano and thrashing out at the end of a very long day. 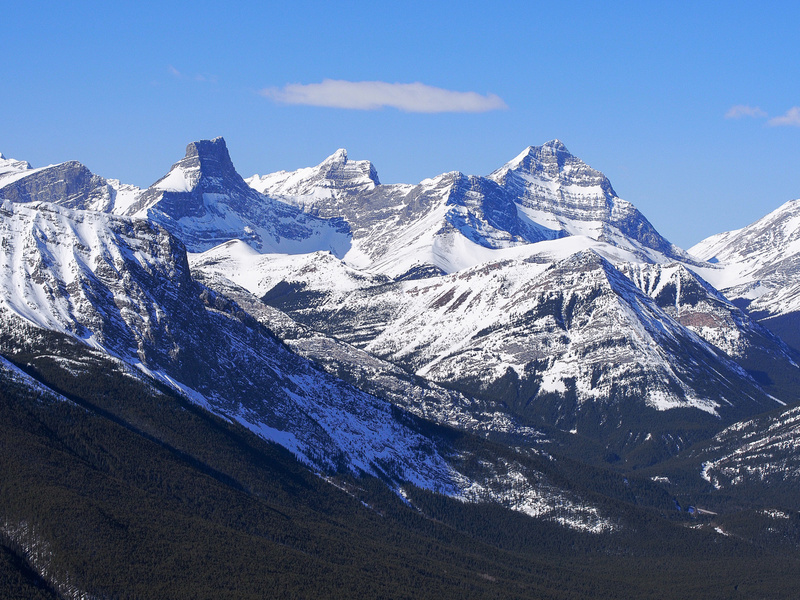 More often, it’s done as part of a trio of peaks consisting of Old Baldy, McDougall and then Volcano or in the reverse from Volcano to Old Baldy. 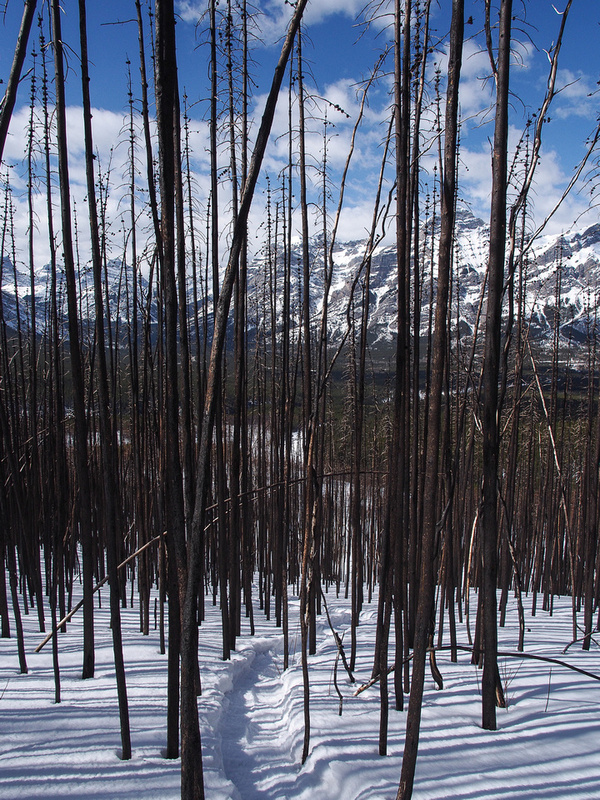 Coming off Volcano is always considered “hellish bushwhacking” which includes a stint in a burnt area and then a very confusing time finding the Evan-Thomas trail. A much less popular option is ascending Volcano on its own. This option elevates the peak from a mere ‘bump’ at the end of a long day to an actual peak with over 1000 meters height gain and a good bushwhack to boot – or ‘shoe in my case. I wasn’t in a hurry and managed to leave the Evan-Thomas parking lot around 09:30 after meeting Matt Clay and his partner. 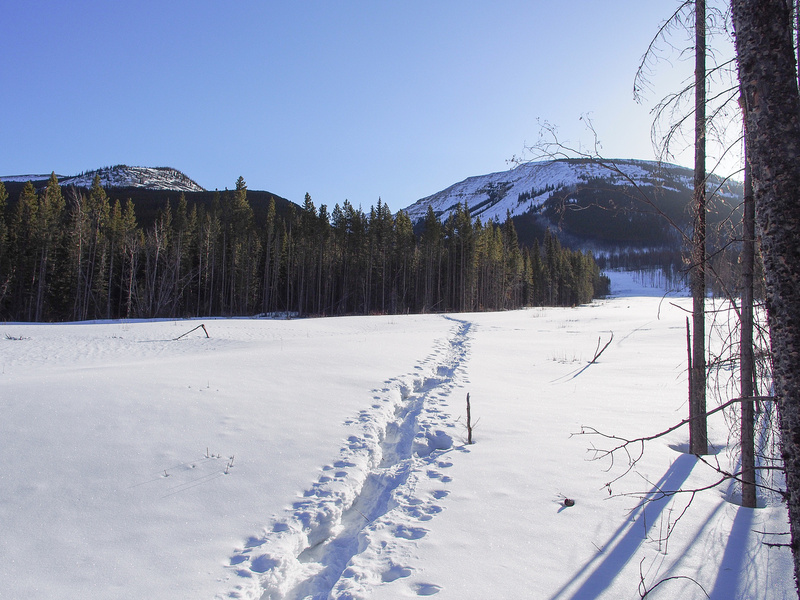 I knew roughly where to go and obviously there should be snowshoe tracks branching off to my left about 200 meters past the trail to Old Baldy ridge / mountain and that’s exactly what I found. 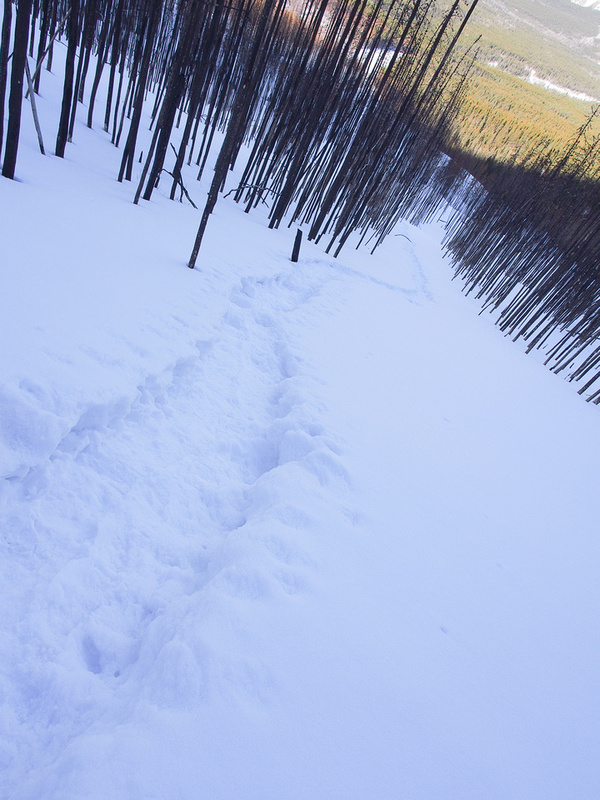 After about 20 meters in the trees I was delighted to break out into an obvious clearing, leading straight to the burn area on the west flank of Volcano. 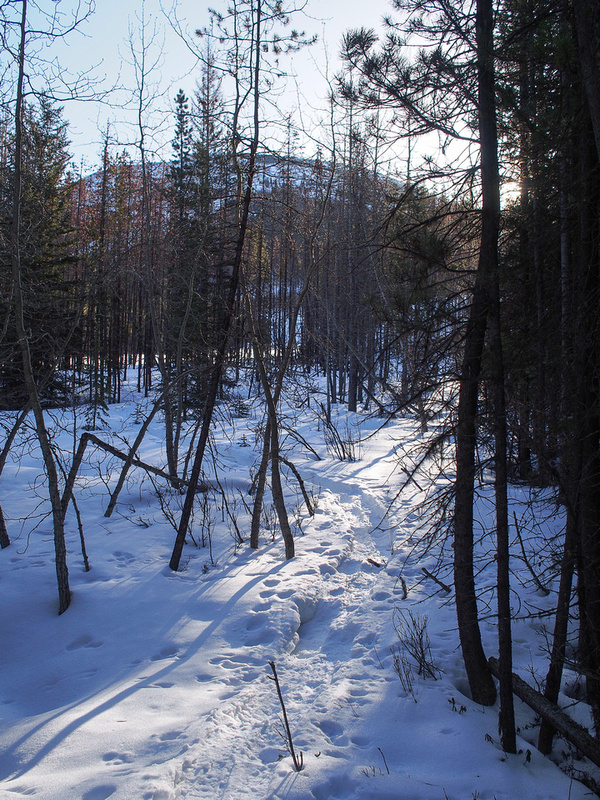 The snow was hard pack and I quickly worked my way up the clearing. 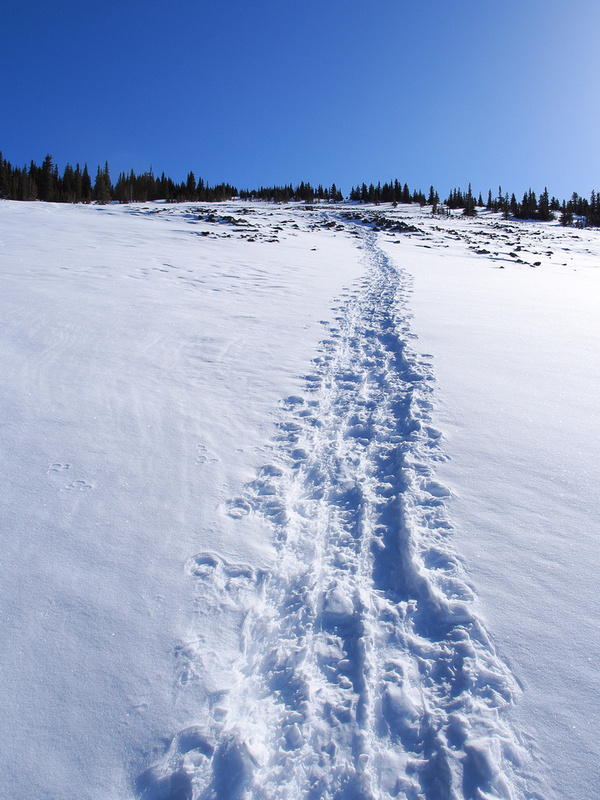 The tracks followed a natural draw slightly to climber’s left before climbing a steep bank to climber’s right as the draw ended in forest. 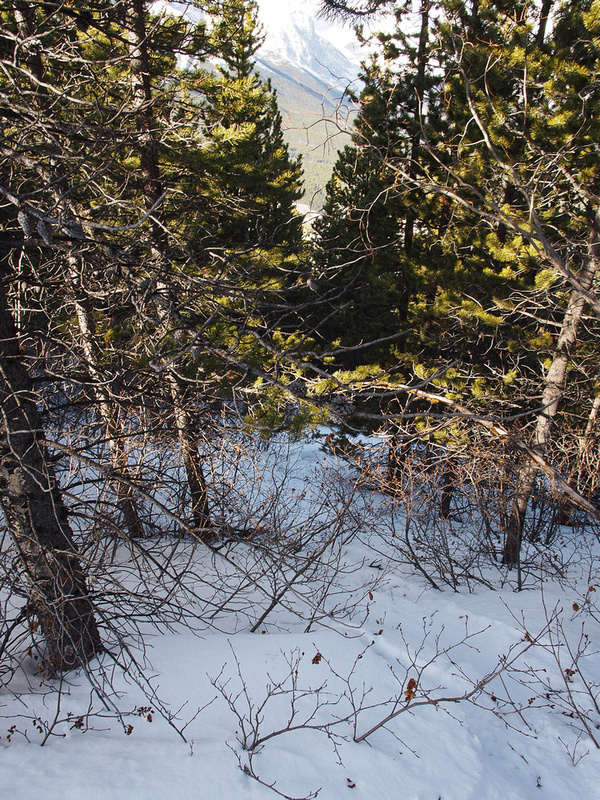 From here the going went from easy to difficult to downright nasty – progressing from open slopes to the burn to the entangled mess of shrubs and trees before finally breaking back onto cleared slopes between stands of trees. I have to be honest and give credit to Jose and Fab. 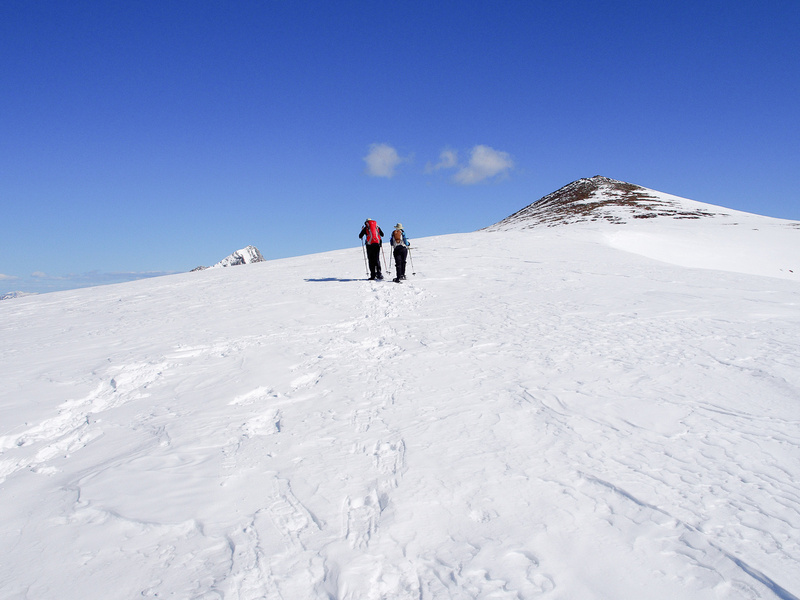 Without their determination and their tracks I would have turned back and never bothered with this peak again! 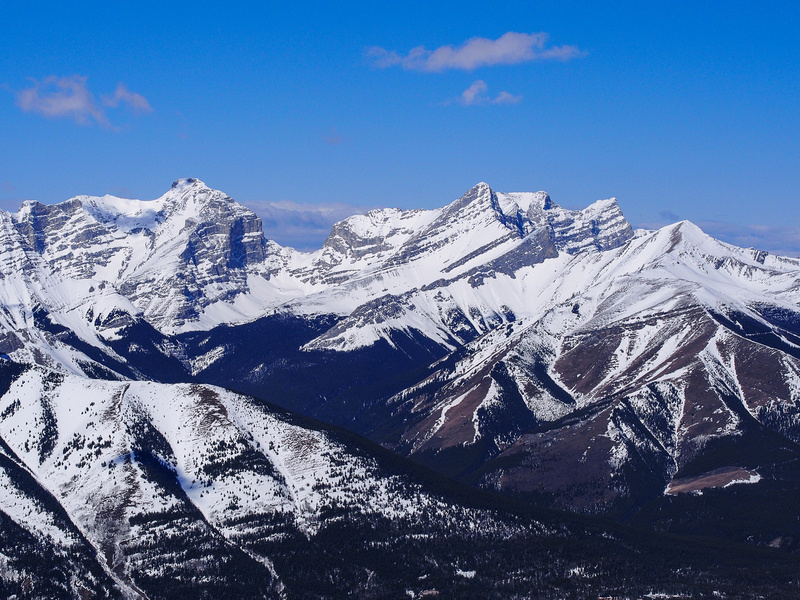 Pano looking over at Old Baldy on the far left and McDougall on center right. 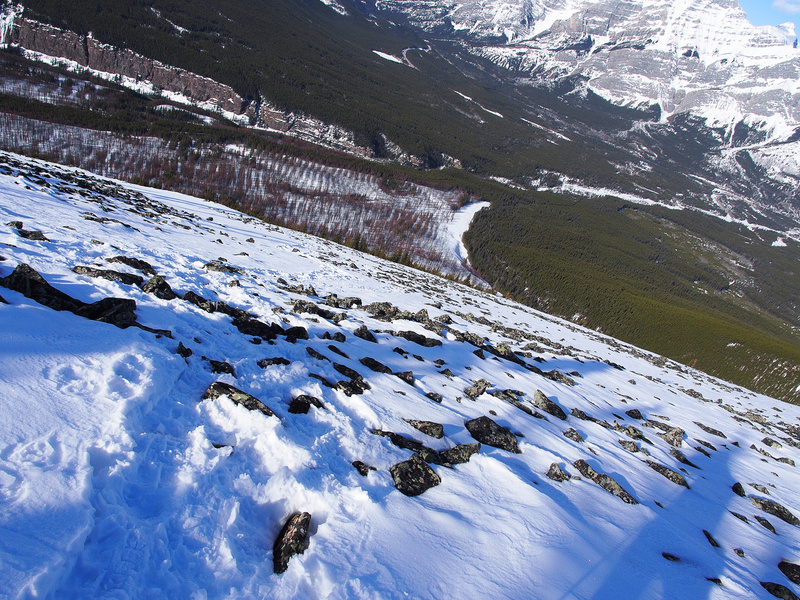 The normal traverse route goes over Old Baldy to McDougall and then Volcano – this is as long as it looks and apparently harder too. 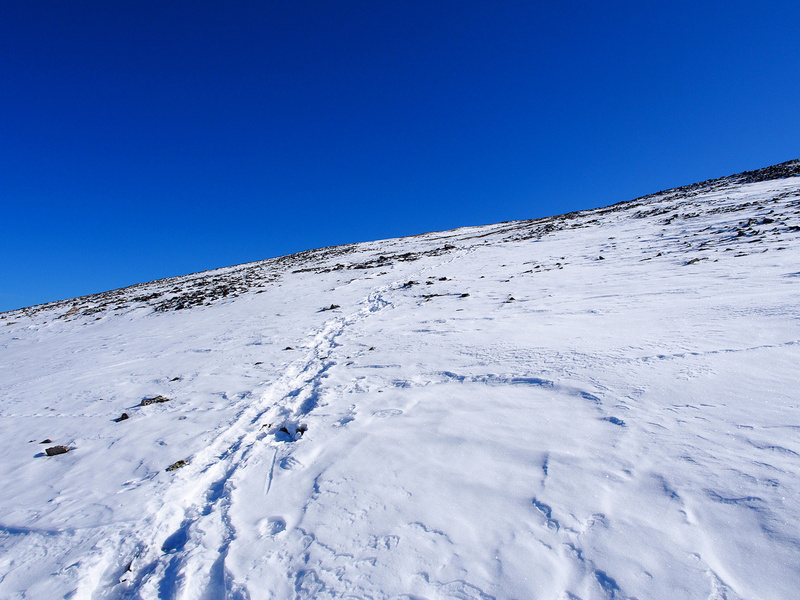 Once I hit the more open upper slopes my pace increased and before long I was grunting up the final slopes to the summit. The views were spectacular but the wind was biting so I didn’t linger too long. I took a nice break out of the wind on my descent before going back through the hellish bush (thankfully it’s easier on descent). 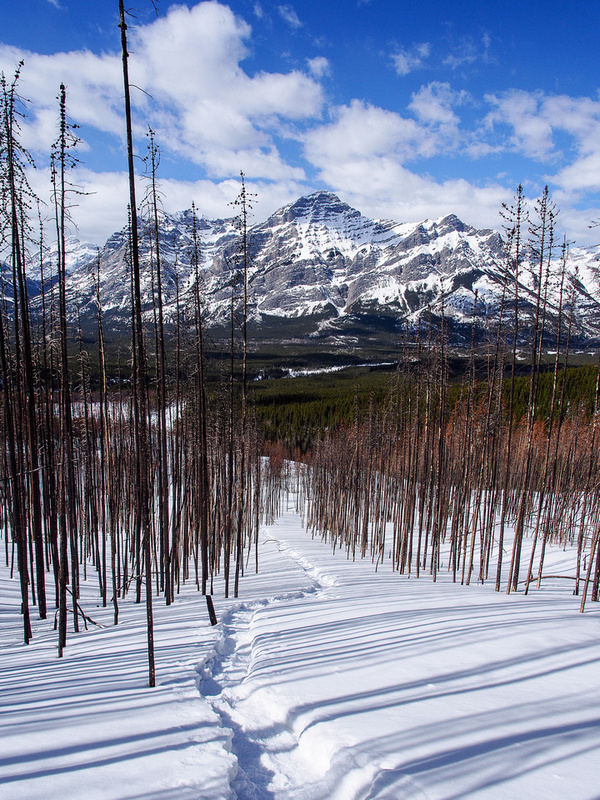 The snow was starting to lose it’s strength as I descended but thankfully it pretty much held me until I got back to the Evan-Thomas trail. At that point the ‘shoes came off and I tramped back to the truck. I can’t say I highly recommend this peak. I guess with a good GPS track available now it’s slightly more favorable but don’t expect to match my time unless someone has been kind enough to break a trail for you already! I would also save this for a snowshoe trip as the bushwhack would be much worse on a hot summer day. A very short stint in trees just off the Evan-Thomas trail before entering a clearing. The shallow draw that slowly goes to climber's left before ending and forcing me back up to climber's right. The lower mountain isn't bad - kind of neat through the burn. Looking back at the nasty stuff. This is really tight and 'grabby' bush whacking - and it's VERY steep which makes it much harder to ascend! Wedge, Fortress, Gusty, Galatea, the Tower, South and North Kidd, Bogart, Ribbon, Sparrowhawk, Allan, Wind. A gorgeous spring morning - view towards the Fortress, Gusty and Galatea. I remember scrambling the Wedge on a gorgeous October day in 2003 and actually falling asleep for two hours on the summit! 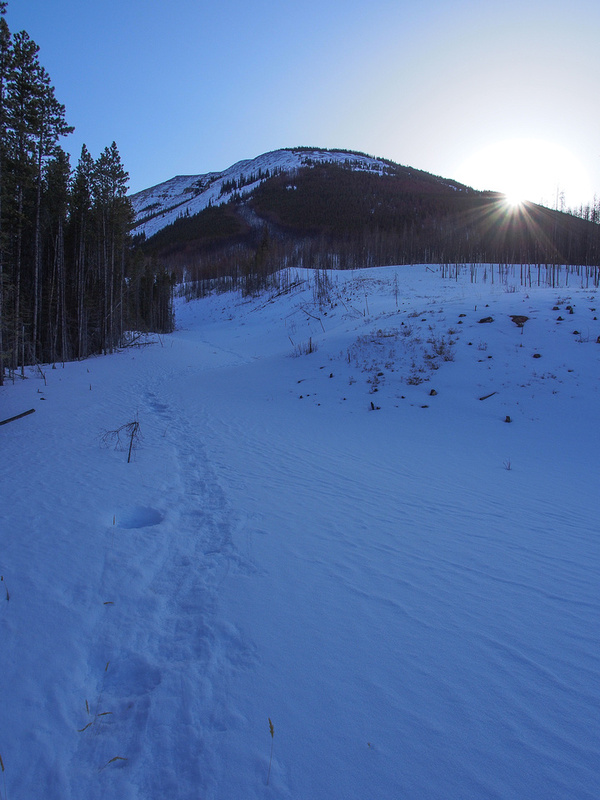 Looking back down the open slopes to the burn and the open path that I started on. 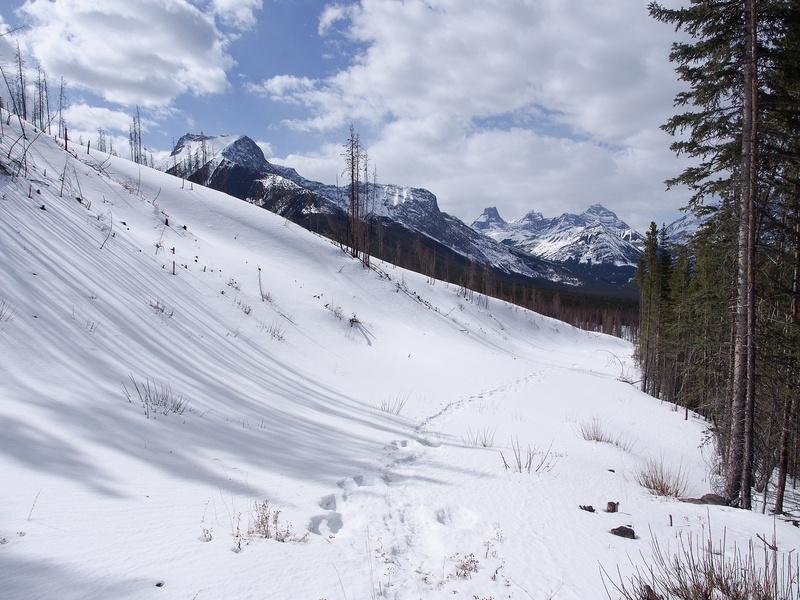 The peak comes into view - Old Baldy on the left. 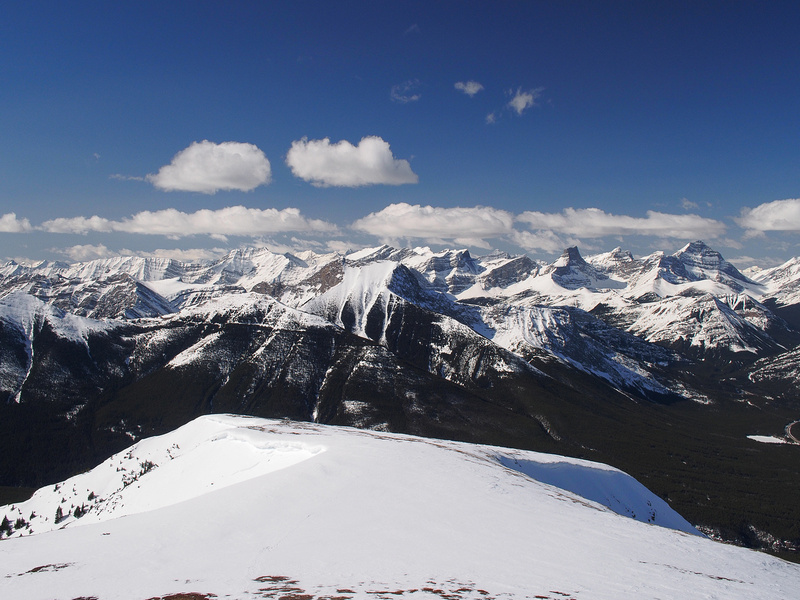 McDougall, Old Baldy, Wasootch, Collembolla, Allan, Lougheed, Wind, Sparrowhawk, Ribbon, Bogart, Kidd, The Tower, Galatea, Gusty, Fortress, Chester, Wedge, James Walker, Opal Range, Fisher. 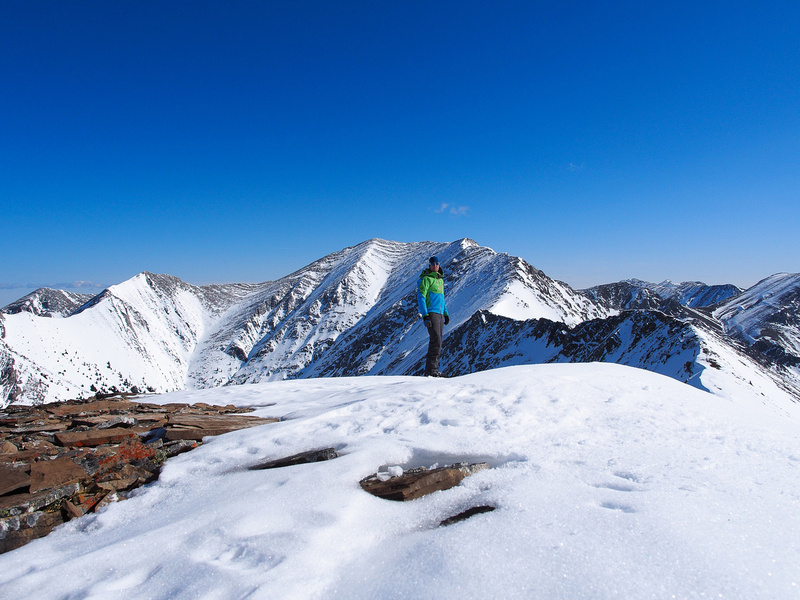 Vern on the summit of Volcano Peak - McDougall in the background. Using my polarizing filter to bring out the clouds - I love this view over hwy 40 towards the Spray Lakes peaks. 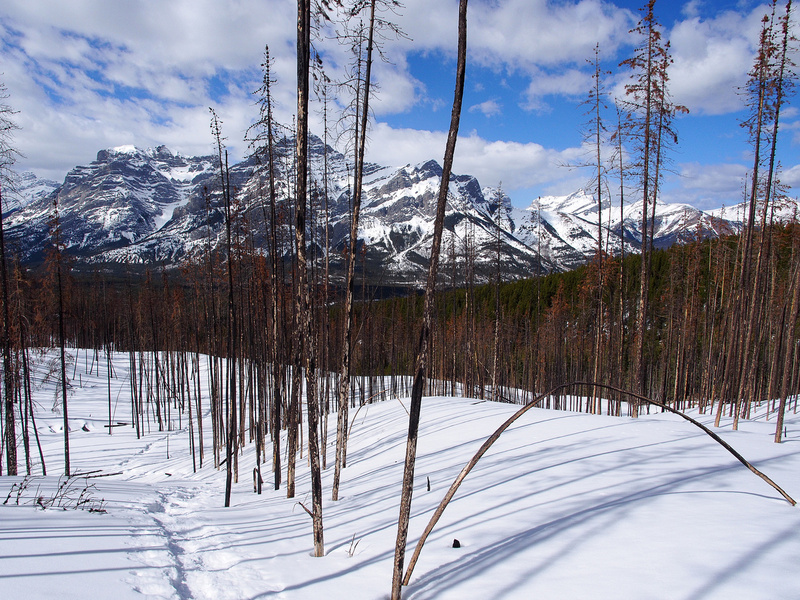 Pano looking over at Old Baldy on the far left and McDougall on center right. 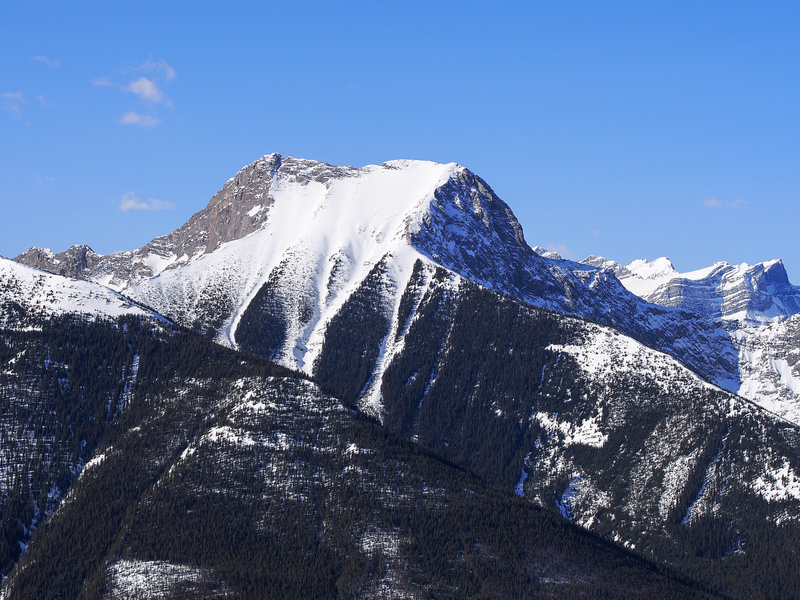 One more pano looking north and west over hwy 40 and Kananaskis Village. 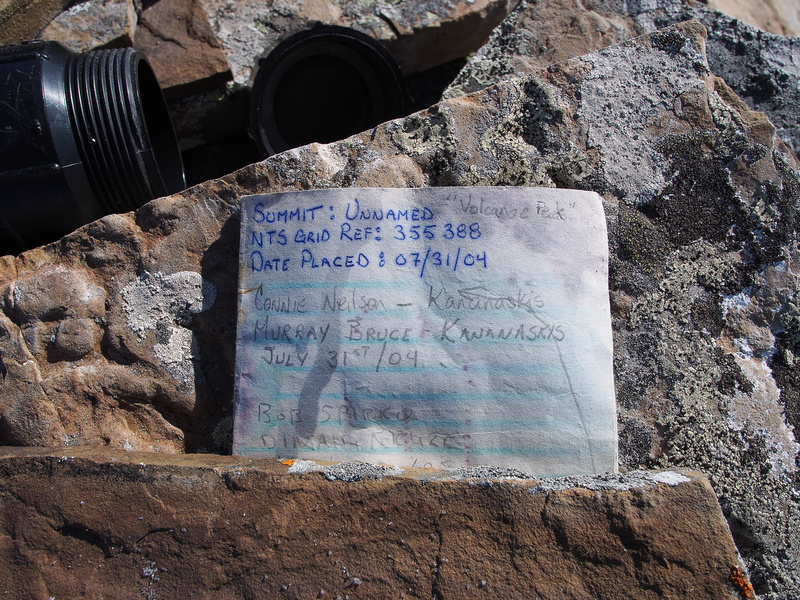 The summit register is almost 10 years old and isn't even close to half full. That should worry you. Old Baldy looks like a serious objective with snow and from this angle. It wasn't easy back in October 2012 when I did it in snowy conditions. 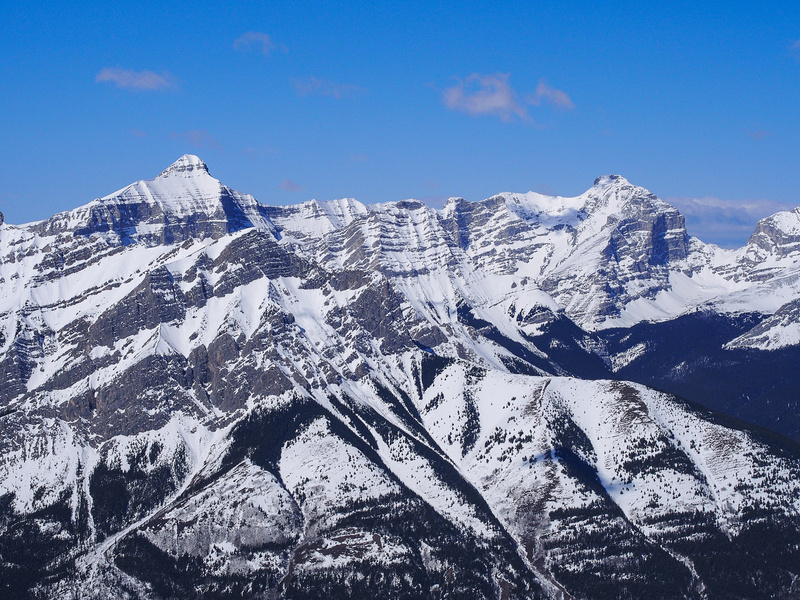 Tele shot of Sparrowhawk, Wind, Lougheed and Mount Allan. 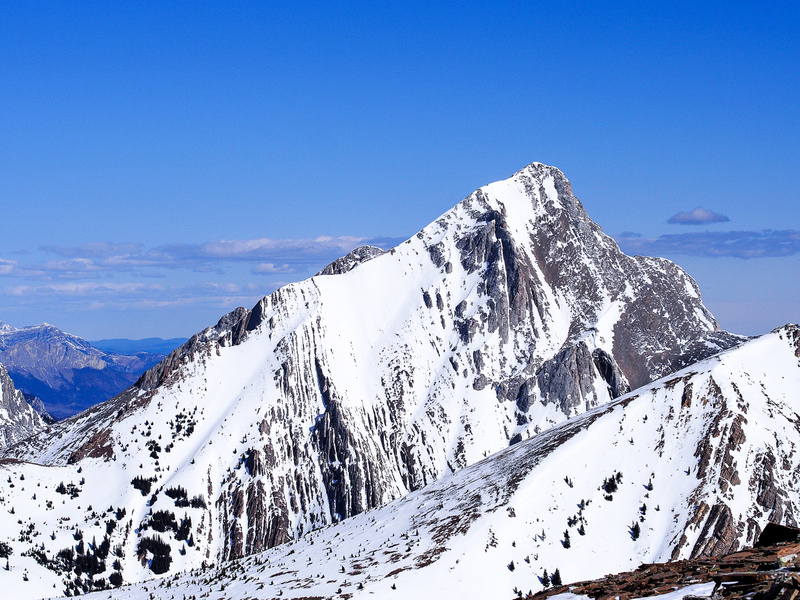 Bogart (L) and Sparrowhawk (R) with Ribbon Peak obscured in front of Bogart. 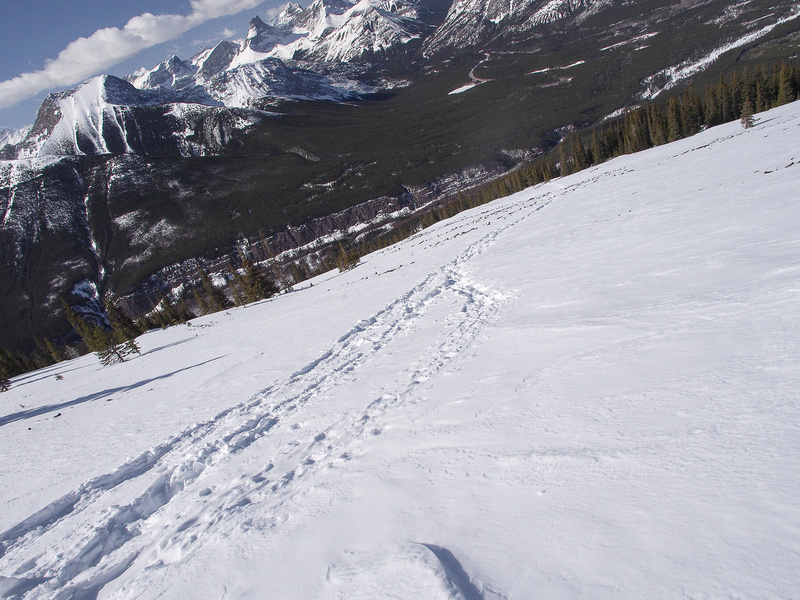 Time to descend before it gets too warm and the snowpack collapses! 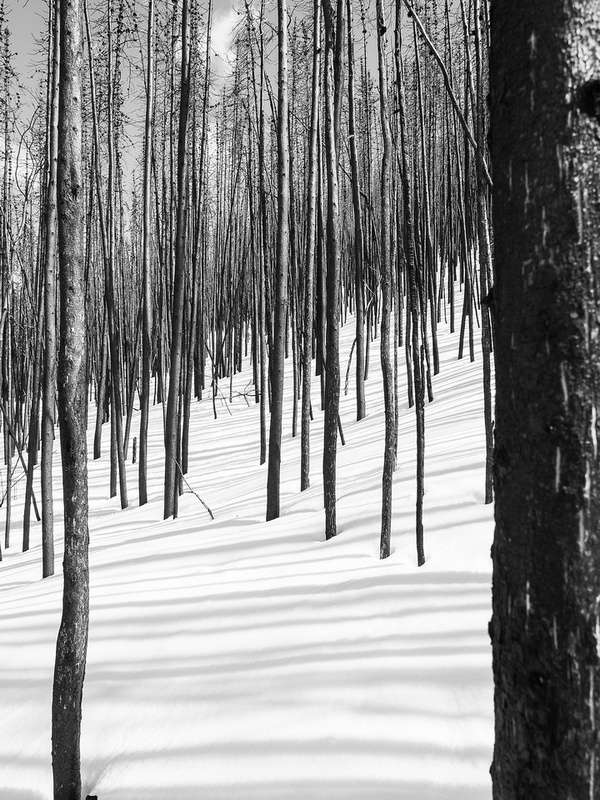 I love photographing in burn areas! 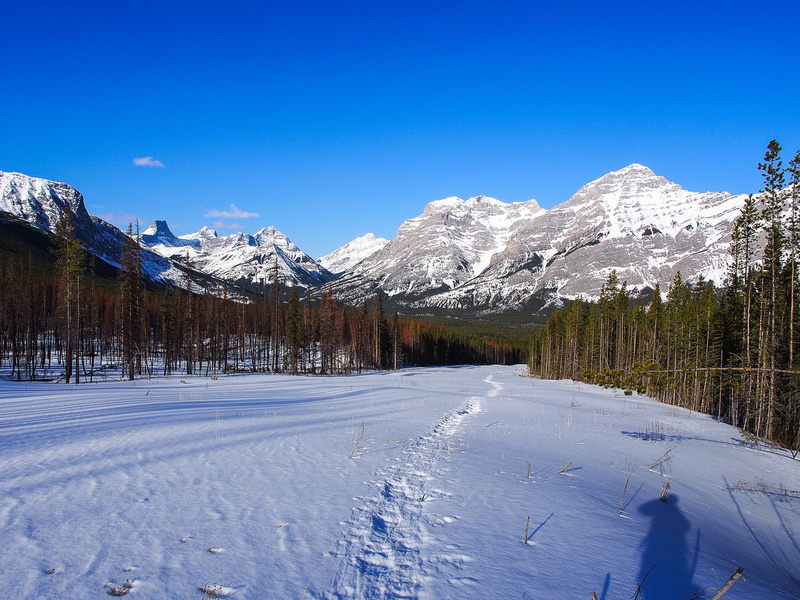 Looking down the tracks with Mount Kidd in the background. 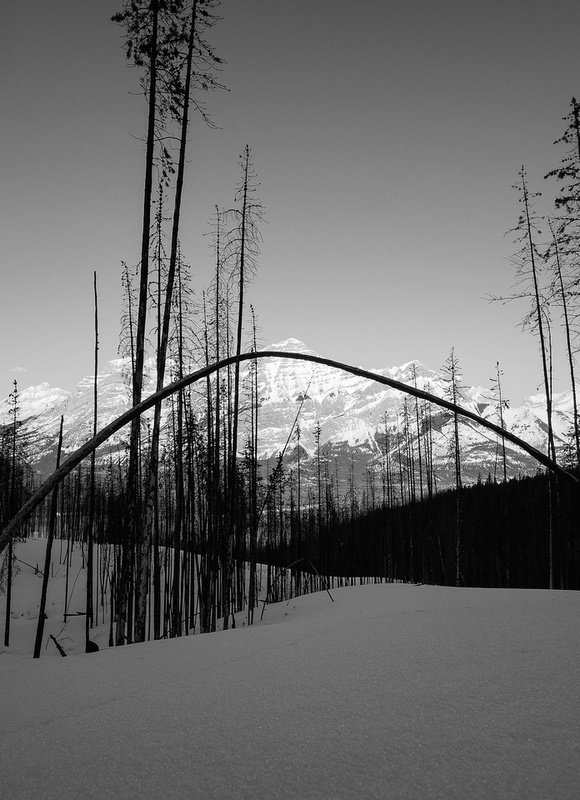 Looking down the tracks with Mount Kidd in the background. Descending the shallow draw to the trailhead.